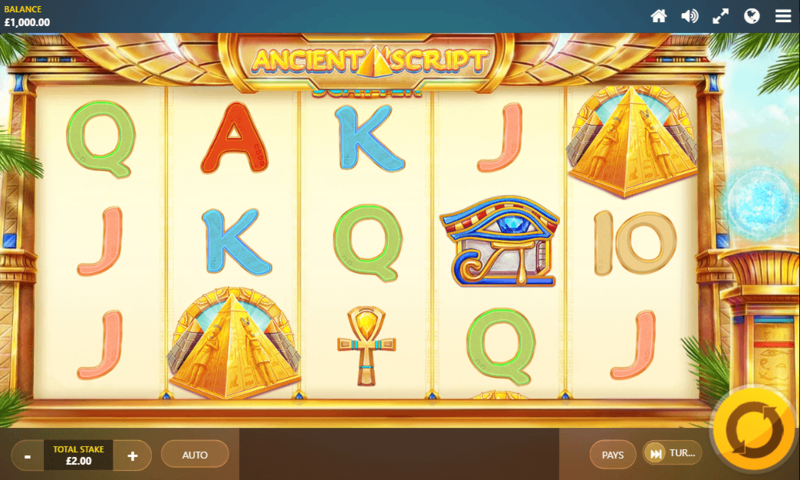 Play Ancient Script Slot Online with 500 Free Spins! Ancient Script is a 5 reels, 10 paylines online slot game by Red Tiger Gaming. Ancient Script has Wild, Scatter Symbol, Free Spins, and Expanding Tiles features and an RTP of 95.03%. The best place to play this slot is with us at Rose Slots, where we also play host to more than 500 fantastic UK online slots including Fluffy Favourites, Starburst, Rainbow Riches and Great Rhino. There are plenty of online slot games which use Ancient Egypt as a theme. For a lot of readers, studying Ancient Egypt was their favorite part of history classes at school. It's a magical and mystical era full of Gods, Pharaohs and incredible architecture, including the Sphinx and the pyramids. Sometimes, it's hard to believe that such a seemingly advances civilization could have existed on Earth in the first place, and then been defeated. It's no wonder there are so many crazy alien conspiracy theories about the Egyptians! We'll stay away from the conspiracy theories though, because the Ancient Script slot is very much real, and it's here for us to play. It's a semi-recent release from Red Tiger Gaming, having been released towards the end of 2016. Graphically it's solid without taking your breath away; it depicts the Ancient Egyptian landscape in a warm and colorful manner, akin to the way you may see it drawn in a comic book or cartoon. It's not photo-realistic, but it's friendly, and it makes for a lively playing area. That playing area consists of five reels and three rows, set into a golden frame which is presumably part of a pharaoh's temple. The blue skies of the desert are visible in the background, with the fringes of palm trees in the corners helping to add to the exotic atmosphere. On a stand to the right of the reels as you see them, there's a strange-looking blue ball of energy. Keep an eye on that; it's not just there for decorative purposes, and we'll be talking more about it later. The design of the symbols complements the theme perfectly. Even the lowest values - represented by playing cards 10 through to A - have been given a design tweak to make them fit with their surroundings. Above them are a few symbols of Egyptian lore and myth; an ankh, the Eye of Horus, a colorful shepherd’s crook and the Great Pyramid of Giza. The slot also has a wild symbol, which is depicted by the golden mask of Tutankhamun. The wild also serves as the slot’s scatter. We love it when we come across online slots which employ this strategy, as we don’t have to worry about what the wild will and won’t substitute for. In the case of Ancient Script, it will replace absolutely any other symbol to create paying lines. Red Tiger Gaming hasn't been around the world of UK online slots as long as some of the other developers whose slots we feature; they only formed in 2014, and are stationed on the Isle of Man. Don't let their youth fool you though; they drew on experts and veterans from all aspects of the online casino world when they put their team together, and there is decades' worth of experience in both their management and design teams. Interestingly, their website claims that they have ‘secret magicians' among their staff alongside all of the usual roles you'd expect to see. We like a developer who has a sense of fun, and it seems Red Tiger Gaming have plenty of it. Because of their comparatively recent formation, any slot by Red Tiger looks fit for the modern age. Plenty of other developers of online slots have ‘old classics' still online, where you can forgive the fact that the graphics are beginning to look shabby because the playing experience is so good. Red Tiger doesn't have to fall back on that; they were born into the HD age, and so any slot they develop looks slick and modern. As evidenced by Ancient Script they don't often go for the cinematic, but you always get the impression you're playing something new when you load one of their slots. Other standout slots from Red Tiger at this early stage of their development include Lucky Wizard slot game, Thor’s Lightning, Esqueleto Mariachi slot, and Crazy Genie. We told you to keep an eye on that strange blue ball of energy, and that’s because it comes into play here, in the Ancient Scripts bonus features. The specific feature it works with is Expanding Tiles, which would be more accurately described as a reel modifier. Any time you spin and land a winning line, the magic properties of the energy ball may change form and become any one of the slot’s standard symbols. When it does so, any symbol on the reels that it matches with will expand and fill the whole reel. If your luck is in, this could mean you have several reels completely made up of matching symbols, and therefore a big win. The more conventional of the bonus features is a Free Spins round, but it works hand-in-hand with the Expanding Tiles feature above to boost both your winning changes and your prize money. You’ll need to land three of the wild/scatter symbols to get the round started, for which you’ll receive ten free spins. Ten may sound like a lot, but the Expanding Tiles feature is active on every single one of them. That means ten chances to score big wins, with whole reels full of matching symbols. Ten good free spins in Ancient Script is easily as profitable as thirty free spins on other online slot games where the feature isn’t quite so generous. All told, Ancient Script won’t be the best-looking online slot you play today, nor does it have the most exciting range of bonus features. When the bonuses are going your way, though, it’s more than a match for any of the online slot games we’ve played when it comes to giving you the chance of a big win.